Search Engine Friendly design templates will help you boost your internet site ranking in search end results. Due to the use of Bootstrap a website will adjust its content to any screen size. It's necessary for both Search engine optimisation and website visitors. Portfolio website is a kind of website that enables presenting various items (services, artworks, products, etc). Portfolio is the most effective solution to to be artistic using the details about you and your business and successfully draw in your future valued clients. WPML is a element that makes it possible to make your webpage multilingual. WPML-ready WordPress web themes provide you with the potential to translate internet pages, tag words, different categories, and so on in a selection of foreign languages. This makes your web site content better to understand for worldwide purchasers. Responsive design provides a much better user experience for those that check out a website page on a smartphone or any other gadget, as well as helps to boost rankings of a website in search engine results pages. Can I resell WordPress themes for Beauty I bought the developers license for? You cannot resell the customized WordPress template for Tatoo Ink Shop as a template, but you may sell it as a project to your client. Make sure that these charges for WP theme for Beauty Store have different order IDs. If it is so, contact our billing department. What is a unique purchase license for WP theme for Beauty Store? If you purchase the product at a â€˜Unique price' it guarantees that you are the first and the last person to buy this WP theme for Beauty Store from us. It means that this template has not been sold before and you become an owner of a unique design. After this kind of purchase the template is being permanently removed from our sales directory and is never available to other customers again. The unique purchase license allows you to develop the unlimited number of projects based on this template, but the template should be customized differently for every project. Can I use graphics from WordPress template for Beauty I purchased for use in printing? Yes, it's not prohibited to use the WordPress template for Beauty graphics for printed material, but the resolution of the templates graphics ( except for logo templates) is not enough for printing. Can I put a line at the bottom ( or any other spot) of the customized WordPress design for Massage Salon "Website design by Company name"? No, you cannot place a line at the bottom ( or any other spot) of the customized WordPress design for Massage Salon saying "Website design by Company name". Nevertheless, you can place "Customized by Company name". Is it possible that Template Monster will contact my client which website I made from Template Monster's website WordPress template for Beauty? Yes, our legal department checks licenses regularly. In case we won't find designer's contact information on the site which was made from the WordPress template for Beauty of ours we will contact the owner of the site directly. Can I put low resolution thumbnails of WP templates for Fashion & Beauty News on my website for my clients to choose designs? What is the price for acquiring the extended license for WordPress theme for Fashion & Beauty? There is no set price for acquiring the extended license. The price is based on the WordPress theme for Fashion & Beauty's unique price for those templates you would like to use for the integration. The price for purchasing license for a single template is half of the template unique price. Are there any discounts if I'm buying over 10, 20, 30 or more WordPress design for Tattoo Salon? 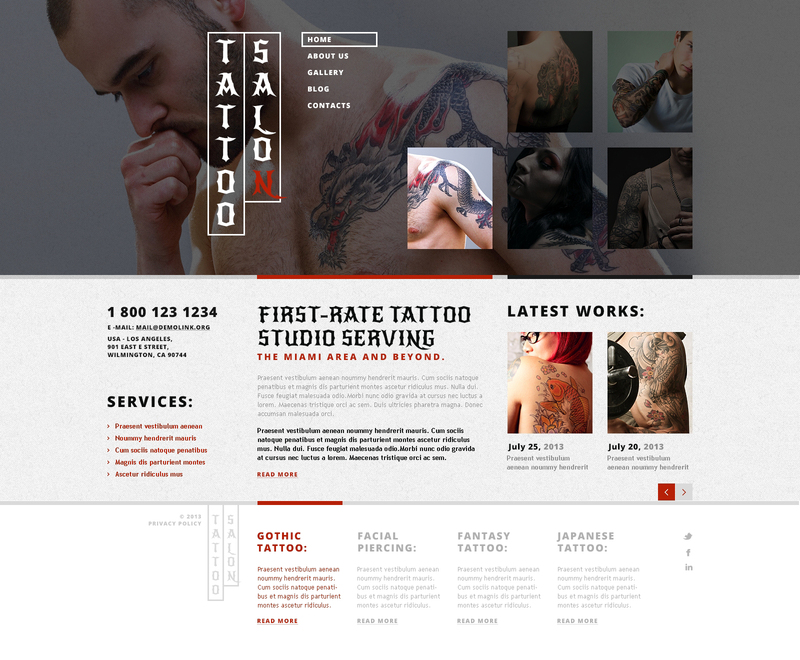 Please email to marketing@templatemonster.com with your inquiries about Tattoo Parlor WP templates. Can I customize the Tattoo Art Shop WordPress design if that's required by application settings? Yes, you can customize the Tattoo Art Shop WordPress design code, graphics, fonts to any extent needed. Can I get the Beauty WordPress theme in higher resolution to use for printing? No, we design WordPress themes for Tattooer optimized for web resolution only. Are there any limitations on selling the WordPress design for Beauty Blog as the integral part of my new product? How can I modify Beauty Parlour WordPress theme to suit my particular website? Please visit our Online Help Center to obtain detailed instructions on editing Beauty Parlour WordPress theme. Is it possible to use your WP templates for Hair Salon to develop websites for my customers? Yes. It is perfect for designers who want to offer their customers a high-quality design and also save time and money. Keep in mind that when you purchase the Beauty Tips WP template with ordinary or exclusive license you're entitled to create only one project (one domain name). What is a one time usage license for a Salon Stuff WP theme? When you buy the Salon Stuff WP theme at usual price you automatically get the one time usage license. It enables you to use each individual product on a single website only, belonging to either you or your client. You have to purchase the same template again if you plan to use the same design in connection with another or other projects. When passing files to your client please delete the template files from your computer. Is it possible to reactivate my download link for WordPress template for Fashion & Beauty News if it was deactivated after 3 days? Yes. Please re-activate the download link for WordPress template for Fashion & Beauty News within your account under the Downloads tab or contact our billing department directly regarding that. Are there any restrictions for using imagery, cliparts and fonts from the WordPress design for Massage Salon I purchased? All imagery, clipart and fonts used in WordPress design for Massage Salon are royalty-free, if not stated otherwise on the product page, and are the integral part of our products. One Time Usage License and Developers License give you the right to use images, clipart and fonts only as a part of the website you build using your template. You can use imagery, clipart and fonts to develop one project only. Any kind of separate usage or distribution is strictly prohibited. Can I resell the WordPress design themes for Tattoo Artist I bought the extended license for? No, you cannot resell the WordPress design themes for Tattoo Artist as is. You can only sell them as the integral part of your new product. Will the Beauty Tips WP template be deleted from TemplateMonster database? No, the Beauty Tips WP template will not be deleted from TemplateMonster database.